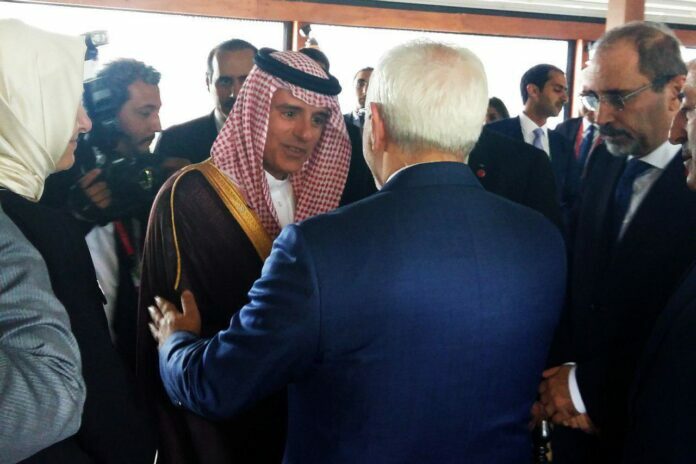 Iranian Foreign Minister Mohammad Javad Zarif is giving a rare handshake to his Saudi counterpart Adel al-Jubeir on the sidelines of a meeting of the Organization of Islamic Cooperation (OIC) in Istanbul, Turkey, on August 1, 2017. Iranian Foreign Ministry Spokesman Bahram Qassemi has rejected allegations of a “secret” phone call between Iran and Saudi Foreign Minister Adel al-Jubeir, saying that no such call has been made. Speaking in a weekly press briefing in Tehran, Qassemi rejected the report by Qatari media, but at the same time noted that Tehran is interested in having peaceful coexistence with all its neighbours, including Saudi Arabia. Asked about a possible change in Tehran’s stances towards Riyadh following the murder of Saudi dissident journalist Jamal Khashoggi in Istanbul, Qassemi said the Islamic Republic’s approach to its neighbours is principled and sustainable. “We are interested in moving towards a peaceful coexistence with all our neighbours in a way that serves the welfare of the regional nations,” he added. Iran’s Foreign Minister Mohammad Javad Zarif had earlier denied any secret phone calls with his Saudi counterpart, saying that the Saudi government has not made such a move. The Saudi government needs to review its regional policies, and if such a review is to be made, Tehran is prepared for this, because we are keen to have good relations with our neighbours, Zarif told reporters on Thursday at the end of his one-day visit to Pakistan.